BCD, 1'st-Stage, 2'nd Stage, Octopus, Low-Pressure Hoses, Pressure Gauge, HP Hose, Owner Manuals. Looking for a BCD and regulator package for the summer dive season that is high quality and economically priced? The Cressi Solid Scuba Package is just what you're looking for. The Solid BCD is a fantastic Jacket style BCD that provides plenty of lift. This durable BCD has two zippered pockets and multiple D-rings for storage and attachment of accessory items with two 1 (25 mm) technopolymer D-rings on the pockets. The BCD has three over-pressure relief/dump valves with two located on the left and right shoulders and a third lower valve on the rear right of the air cell. All three can be manually dumped two with pull cords and the other with the power inflator mechanism. If used at dive facilities a size indicator is highly visible on the right shoulder. BCD adjustable sternum strap along with both 2 (50 mm) torso adjustment straps and waist strap are all equipped with squeeze-style side-release buckles for easy donning and doffing. The light-weight back support is rigid for proper cylinder stability but is fully padded for comfort and the ridged backpack is equipped with a grab handle for easy transport and gear donning assist. BCD is built to last made from 500D Cordura (exterior part) and 420D nylon (interior). The Cressi Solid BCD come with a 3/8 threaded quick-disconnect low-pressure hose and owner's manual. The XS Compact AC2 Regulator is an exceptionally dependable non-balanced flow-by-piston designed 1'st stage regulator that is a great choice as a new diver's rig, or for use as a stage bottle regulator system. This simple yet fail-safe design will deliver air even if there is a first stage failure. The 1'st stage has 1 high pressure (HP) 7/16" threaded port and 4 low pressure (LP) 3/8" threaded ports and is made from marine grade chromed brass for long life and durability. A conical filter is used which has greater surface area for higher air flow characteristics through the 1'st stage regulator. The XS Compact Second-Stage housing is made of durable non-corrosive hi-tech polymers and has a dependable downstream demand valve mechanism. The flow of air is channeled to the mouthpiece by injection, creating a venturi effect enhancing the performance. The 2'nd stage comes with a flow deviator that acts on the venturi effect, with dive/pre-dive adjustment function. Large soft purge cover allows easy clearing of 2'nd stage and a comfortable silicone mouthpiece for breathing comfort. The XS Compact AC2 Regulator weighs 35 oz. (994 g) with hose and comes with an owner's manual. The 2nd stage comes with a flow deviator that acts on the Venturi effect, with dive/pre-dive adjustment function. Large soft purge cover allows easy clearing of 2'nd stage and a comfortable silicone mouthpiece. The XS Compact Regulator comes with a long 3/8 hose and owner's manual. The Cressi Mini-Manometer Pressure Gauge luminescent dial reads from 0 to 5000 psi. For at-a-glance monitoring of air pressure the instruments face is divided into three different colored zones: 600 psi and below is highlighted in red with a solid bar and red stripes. If gauge is used on deeper dives, the red scale extends and fades to 1,300 psi, this provides for added reserve air indication required at greater depths. From 600 to approximately 3,000 psi is green and from 3,000 to end of scale is blue. The front glass lens is made to act as a pressure relief valve. In the event of a sudden increase in pressure inside the instrument, the glass rises slightly, allowing the excess pressure to escape. The instrument is housed in a small, modern shaped boot, made from polycarbonate and Desmopan, (a thermoplastic polyurethane) two materials that guarantee protection from shocks, scratches and which, at the same time, is very lightweight. The pressure gauge housing is durable chrome plated brass. The gauge boot has an attachment point for a clip or lanyard. Pressure gauge is equipped with a 7/16 threaded high-pressure hose. The instrument console is made in Italy. Complete Life Support BCD & Regulator System. BCD Available in Multiple Sizes. Great Basic Jacket BCD Design. Two 1 (25 mm) Technopolymer D-Rings On Pockets for Accessory Attachment. Stability of a Jacket Style BC. Large, Easily-Seen Size Markings on Shoulder. Construction: 500D Cordura (exterior part) and 420D Nylon (interior). Light-Weight Rigid Back Support for Proper Cylinder Stability. Fully Padded Back Plate for Comfort. Ridged Backpack Equipped w/Grab Handle for Easy Transport and Gear Donning Assist. Buoyancy Control: 3-Exhaust/Overpressure Relief Valves 2-Vlaves with Pull Dump Handle (Right Shoulder/Lower Rear) Cressi's Power Inflator with Cable Activated Pull Dump 3/8 Threaded Low Pressure Quick-Disconnect Hose. 2 (50 mm) Torso Adjustable Shoulder Straps. Adjustable Waist Strap with Cummerbund Pad for Comfort. All Straps Equipped w/Squeeze-Style Side-Release Buckles. Cressi XS Compact AC2 Regulator. Economical Low Maintenance Regulator Design. 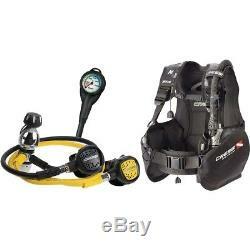 Great Choice for New Divers Rig, or Use for Stage Bottle System. Lightweight Jacketed 3/8 Threaded Low Pressure (LP) Hose. Reliable Downstream Demand Valve System. Venturi Dive/Pre-Dive Switch: Prevent Free-Flow when Not in Use. Marine Grade Chromed Brass Construction. 4 LP Ports, 3/8 Thread. 1 HP Port, 7/16 Thread. Yellow Front Cover for Easy Identification in an Out-of-Air-Emergency. Housing: Durable Non-Corrosive Hi-Tech Polymers. Weight: w/o Hose 4.76 oz. Hose Length: 39 (100 cm). 0 to 5000 psi Readout. Unique Glass Lens Pressure Relief Valve. Color Zones: 0 to 600 psi Highlighted-in-Red, Solid-Bar and Red Stripes Deeper Dives Reserve; Red-Scale Extends and Fades to 1,300 psi Safe Air Zone; 600 psi to Approximately 3,000 psi Green and 3,000 psi to Full Scale is Blue. Boot Material: Durable Polycarbonate and Desmopan Desmopan; Thermoplastic Polyurethane. Protection from Shocks, Scratches and Very Lightweight. Attachment Point for Clip or Lanyard. First Stage: Chromed Brass, Second Stage: Polymer Plastic, Silicone Rubber. (994 g) w/Hose, Octopus; 4.76 oz. Adjustable Torso Straps w/Squeeze-Style Side Release Buckles. Adjustable Waist Strap w/Squeeze-Style Side Release Buckle and Cummerbund Pad. Yes, Adjustable Sternum w/Squeeze-Style Side Release Buckle. Cressi Power Inflator w/Cable-Activated Pull Dump. 500D Cordura (exterior part) and 420D Nylon (interior). Case; Chromed Brass, Lens; Glass, Boot; Polycarbonate And Desmopan. Feedback is a very powerful tool. It gives sellers a reason to conduct business at the highest level of honesty & respect. Many years ago Leisure Pro was the first Internet-based divers supply company. Then, we give another 90 days (120 days from the date of invoice) to return for store credit. We won't even ask why you've changed your mind. Please wait 8 days from date we received the package for us to process your return. The item "Cressi Solid Scuba Package" is in sale since Friday, June 22, 2018. This item is in the category "Sporting Goods\Water Sports\SCUBA & Snorkeling\Buoyancy Compensators". The seller is "leisurepro" and is located in Elizabeth, New Jersey. This item can be shipped to United States.